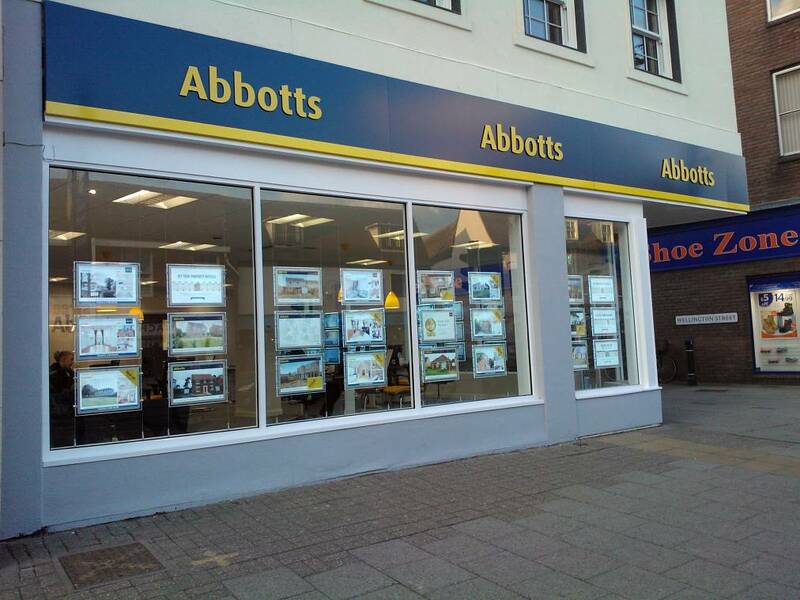 In February 2015 Abbotts Estate Agents moved from Rothsay House - No.124 High Street to this location here. As shown on Chapman's map of Newmarket below, in 1787 this building was part of the Fox & Goose public house at the side of the Fox & Goose Lane. Typical of many of the buildings and houses that fronted onto the High Street, over time shopping habits changed, entrepreneurism set in and these were mostly all converted into the shops that we know today. The Fox & Goose Lane became Wellington Lane in honour of Arthur Wellesley, the 1st Duke of Wellington with his success at the battle of Waterloo in 1815 and then eventually Wellington Street. The name of the pub followed suit and became the Wellington Inn, but with this repeated conversion to shops its length along Wellington Street shrunk (see below for more details). The son of John and Elizabeth Carr, John Walter Carr was born in Barnsley, Yorkshire in 1864 and baptised there on 24th April 1864 at Barnsley St. George church. His wife was Catherine from Grimsby and in 1891 they can be seen in a chemist shop in the hamlet of Wellow, Great Grimsby, Yorkshire. 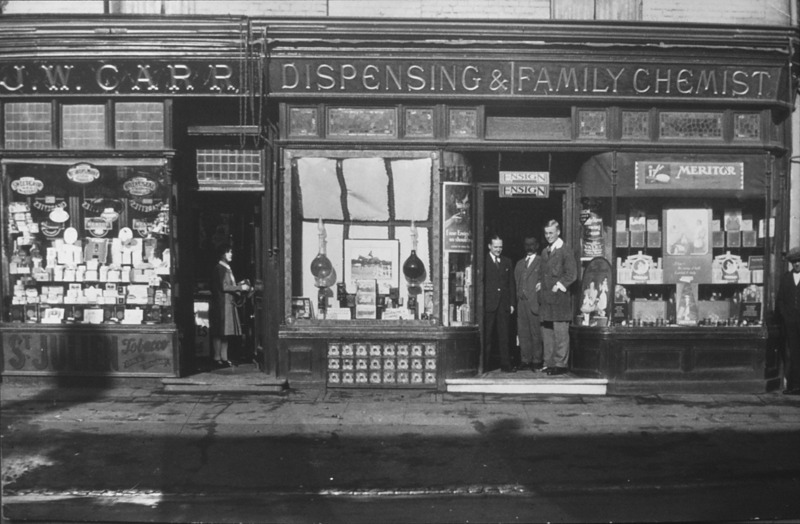 By 1901 he was in this shop in Newmarket, which became known as J.W. Carr, chemist & tobacconist. By 1911 he'd moved again to No.58 High Street, Cleethorpes, but the shop in Newmarket retained his name(?). John Walter Carr died in Cleethorpes on 1st December 1921. 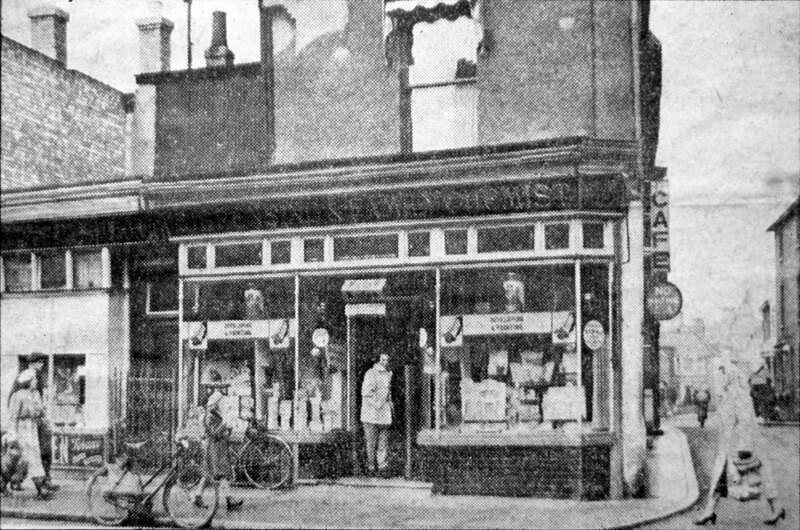 By 1911 Joseph William Daniels from Landgate, Portsmouth had taken over as the chemist here. 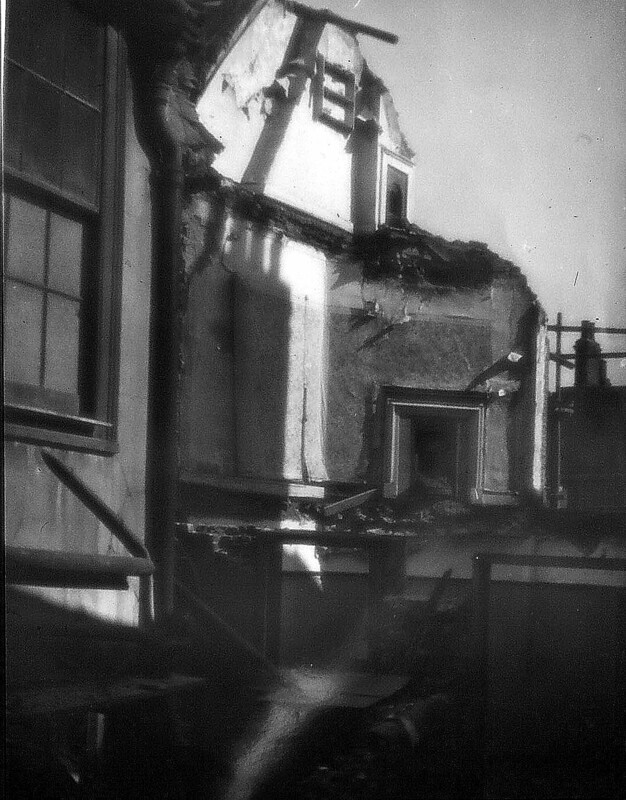 Although it's not a very clear photo, looking east along the High Street the horizontal line of the Wellington pub roof, with its rear dormer windows can be seen stretching across from the left. When it reaches J.W. Carr's shop the roofline turns through 90° and runs parallel to the High Street for at least four shop awning widths. What this seems to confirm is that this whole L-shaped structure was one building - part of the Fox & Goose as detailed above. On the High Street the three first floor windows and the two awnings beneath are all part of Carr's shop - this is now the empty shop that has been recently refurbished and is No.100-102 High Street, although as can be seen in the history listing above it hasn't always been just one shop. J.W. Carr's awning the shop also sold 'Kodak' photographic supplies. 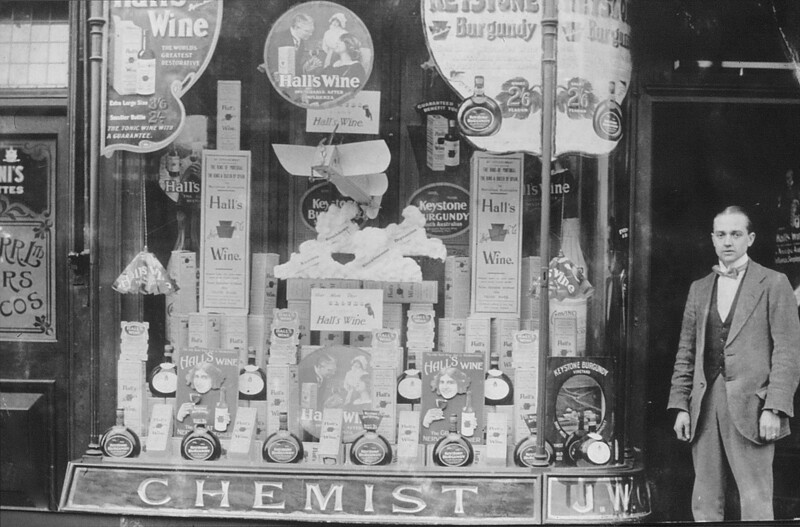 What becomes obvious from looking at the photos below (many thanks to Peter Norman for these), that the chemist & tobacconist, although both part of J.W. 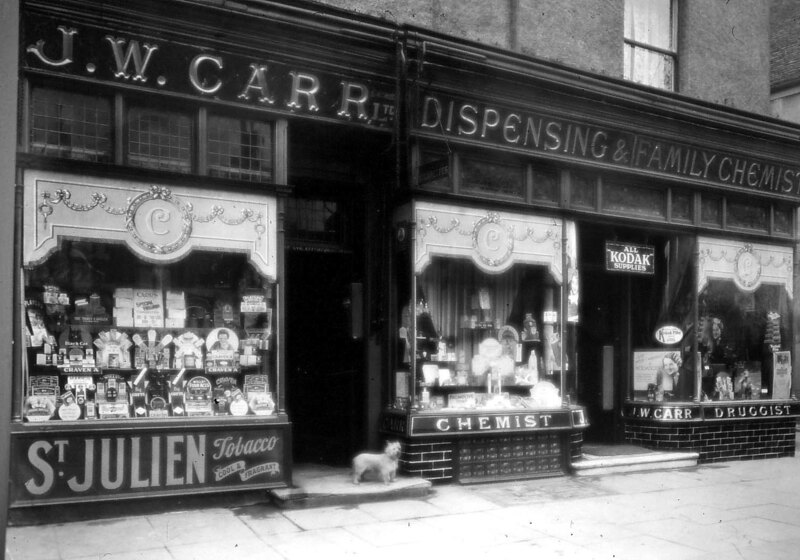 Carr, were actually separate shops - the chemist was in No.100 and the tobacconist was in the smaller No.102. 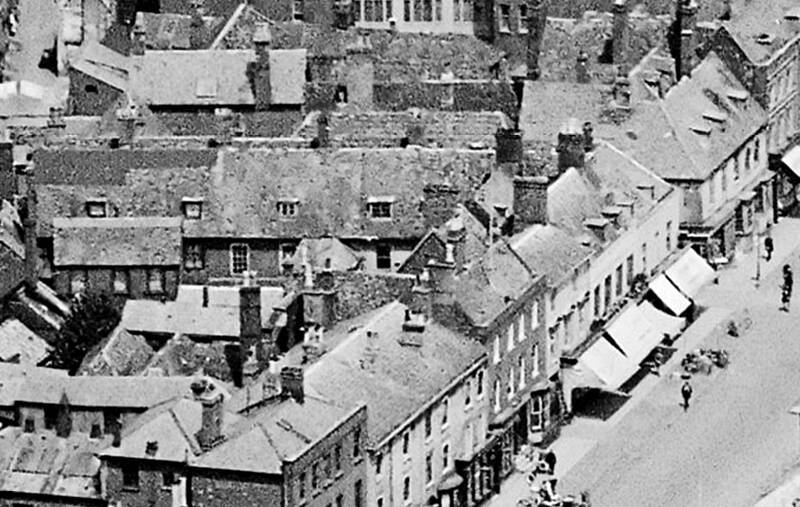 This arrangement matches the two awnings visible in the above 1920s aerial photo. J.W. Carr's was another of those unfortunate buildings in the High Street - in that it was the site of the third bomb that struck Newmarket on February 18th 1941, demolishing the top half of the building, particularly on the tobacconist side. For further details about this devastating event click on the photos underneath (many thanks to Peter Norman for these). 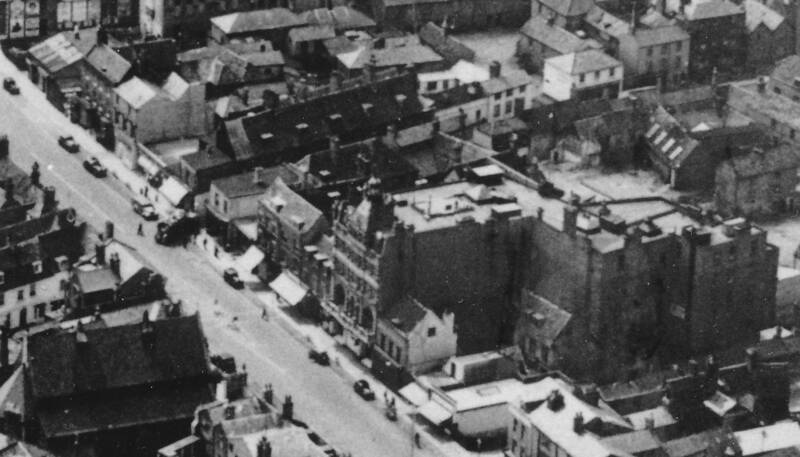 On the above aerial photo from the 1950s, looking from the opposite direction to the 1920s view above, you can once again see the horizontal line of the Wellington pub roof, this time with its row of five front dormer windows. When you come to the left-hand-side of this roof the top of the original L-shaped structure has now gone, completely destroyed by the bomb. The chemist side of J.W. Carr's does have an upper storey, but it's now flat roofed. The upper storey of the tobacconist has completely gone, as has that of the next-door building on the left. The next shop further on from that, with its three first-storey windows is 'Le Bon Bon' confectioners, which seems to have escaped damage. On this aerial view you can just see a truck driving from the High Street into Wellington Street, showing that despite its narrowness it was at one time an active thoroughfare. In July 2009 Holland & Barrett, who already had a shop in the Guineas Centre in Newmarket, were being referred to the Office of Fair Trading following its attempt to purchase the Julian Graves chain. On 2nd July 2012 Julian Graves went into administration and all its 189 stores, including this one at No.100 High Street were closed. In 2013, the founders of Julian Graves established Grape Tree, a chain of 24 shops stocking a similar range of products to the defunct chain, but as-of-yet it hasn't returned to Newmarket. In 2013 the Italian Jewellery in No.102 closed, to concentrate their efforts on the shop in Ely. With both shops closed developers moved in and and using the building company Maze Construction (whose name is visible on the notice inside the door) returned No.100-102 back to one building, with flats in the upper storeys. As can clearly be seen in all the recent photos, this building is not the same as that in any of those showing J.W. 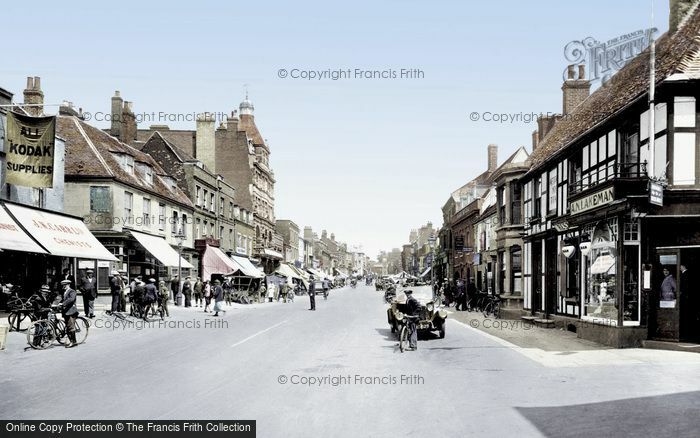 Carr's chemist & tobacconist, even the 1950s aerial view. The building was obviously rebuilt from scratch and any structural link into the Wellington / Fox & Goose pub has now long gone ... though the views above show that the rest of the pub is still present, as can be seen by the front dormer windows on the roof of the first set of shops on this side of Wellington Street. 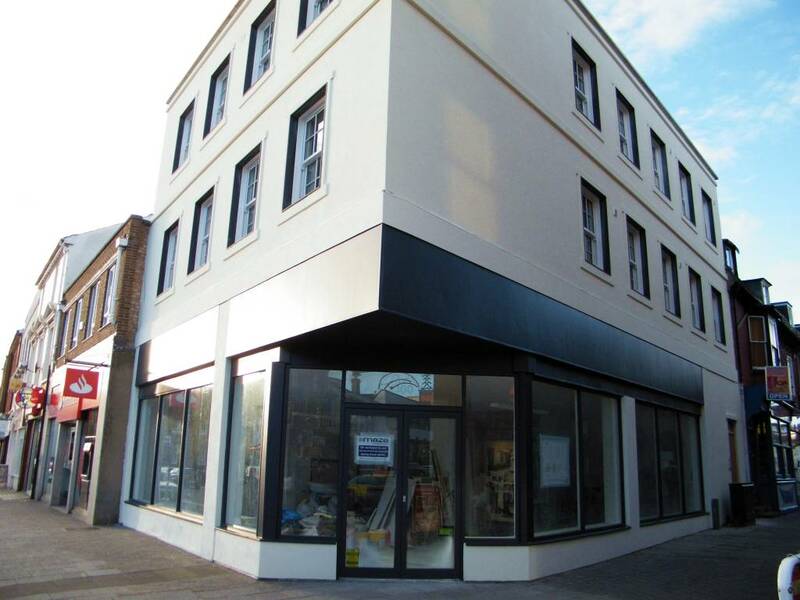 Change of use of part of first floor retail storage to a one-bedroom flat. Conversion of second floor flat into 2 one-bedroom flats, including insertion of a roof window in the rear sloping roof and enclosure of area between stairs and flat entrances at 2nd floor. (Development Affecting the Setting of a Listed Building). New entrance off Wellington Street to access first and second floors (demolition of existing external staircase). 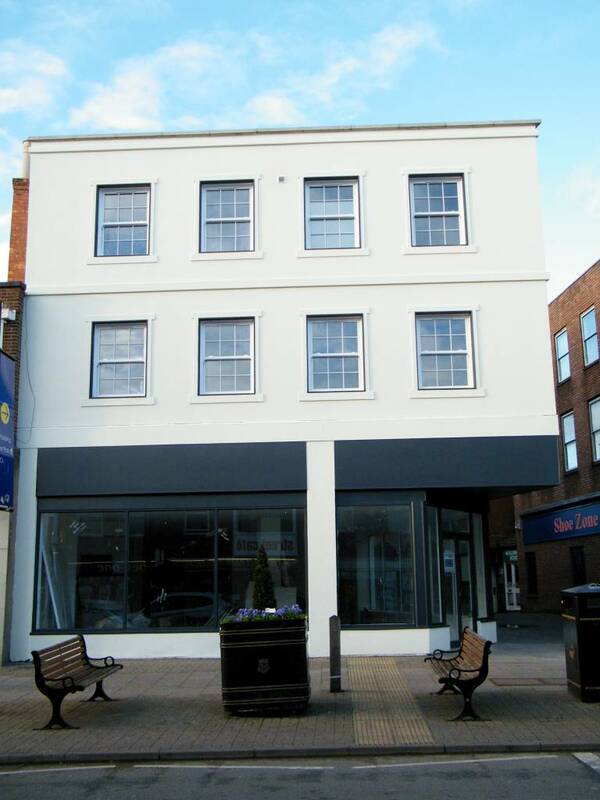 Replacement windows and rendering of street elevations and replacement shopfront. (Development Affecting the Setting of a Listed Building). 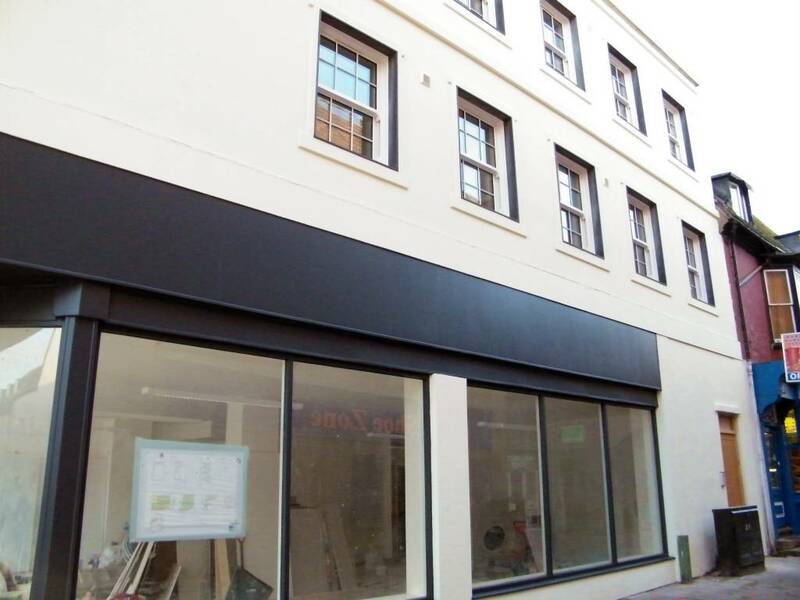 Change of use from Laundrette to fruit and vegetable shop and installation of open shop front incorporating steel roller shutters and retractable blind as amended by drawings received 05/05/94.